Fastway are a heavy metal band formed by guitarist, "Fast" Eddie Clarke, formerly of Motörhead, and bassist, Pete Way, formerly of UFO. In 1983, both players had been disgruntled with their own bands and decided to work together in a new outfit. They recruited drummer, Jerry Shirley, formerly of Humble Pie, and the then unknown vocalist, Dave King. They took their name from a combination of the founding members' names. However, Way then discovered that he could not escape from his recording contract with Chrysalis Records, and then received a tempting offer to play for Ozzy Osbourne, so abandoned the project. Bringing in session bassist, Mick Feat, the band then recorded their debut album, Fastway. They are often incorrectly considered to be a NWOBHM band. NWOBHM bands like Iron Maiden and Motörhead started in 1975, whilst Fastway did not commence until 1983. A critical and commercial success, the band toured to promote the album (with Alfie Agius as their session bass player). The band then recruited Charlie McCracken, formerly of Taste as "permanent" bassist, and released another success in the form of All Fired Up the following year. After the hardships of touring, Shirley and McCracken subsequently left. In 1986 Clarke and King reformed Fastway with a new line-up. Recruiting Shane Carroll (second guitar), Paul Reid (bass), and Alan Connor (drums) from Dave King's first band Stillwood, this line-up released Waiting for the Roar. The record took an album-oriented rock approach instead of the driving bluesy-metal of the previous albums. The success of the record was limited, and it disappointed many fans. In 1987 Fastway was approached to make the soundtrack for the heavy metal horror film, Trick or Treat. The film flopped, but the soundtrack re-established Fastway as a hard hitting metal band. The soundtrack was a moderate success, and stayed on the Billboard Top 200 chart for eleven months. The success of the soundtrack, and the very little money the band received, caused in-fighting and the band disbanded. King took most of the band with him and started Q.E.D., a more AOR styled outfit. They released a two-track single. 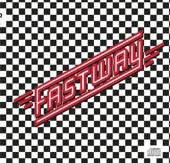 Fastway is the debut album by Fastway.